A long time ago I was a newspaper reporter, so I have a soft spot in my heart for hard-working journalists. They do a thankless job under the constant threat of layoffs and are rewarded with terrible pay and little chance for advancement. So you’ll rarely hear me lash out at a newspaper for what I think is bad journalism. But the Patriot-News yesterday took journalism to a new low with an editorial that urged Penn State to be more transparent – but not too much. The editorial’s headline was encouraging: “In Penn State election, let’s see more transparency and more moxie.” I agree. We need to elect people with the fortitude to change the way the board shares and uses information. I’ve been saying that for three years now, and have proposed measures to do exactly that. But the editorial quickly devolved into another “move on” piece that ordered Penn Staters to stop asking questions about how the Sandusky scandal was handled. Ponder that for a moment: a newspaper, whose sole purpose in society is to ask questions and print answers, advocated for others to stop asking questions. It’s hypocritical. But not only for the reason you think. Two weeks ago, when the Pittsburgh Post-Gazette published a piece about a nixed Paterno tribute based on a cache of public records I obtained, two separate people from the Patriot-News begged me to share the records with it as well. I begrudgingly obliged. But beyond the lesson that a board needs strong, well-informed individual members – which has clearly been learned by this point — there’s little need for today’s Penn State board to wallow in what-ifs about the Sandusky affair. At the risk of being accused of wallowing in hypotheticals, this morning I called Opinion Page Editor John Micek. He knew nothing about me, nothing about my Right-to-Know Law battles, and nothing about the Penn State Sunshine Fund. I asked him to explain how the newspaper can take a position against asking questions about the Sandusky scandal when it did exactly that just two weeks ago. Newsrooms are supposed to keep their advertising and news operations separate to prevent the profiteers in the organization meddling with the editorial independence. But I’ve never heard of opinion writers being barred from talking with their own reporting staff. How in the world can you expect to write a solid opinion piece if you don’t know the basic facts to base that opinion on? (In my little newsroom in Annapolis, our editorial writer would ask us to read his pieces for accuracy if the editorial was based on a reporter’s news story). Micek was defensive and condescending. He believes that, for some unknown reason, asking questions about the Sandusky scandal is hurting Penn State, despite every indication to the contrary. I tried to explain to him that he just didn’t have all the facts, but he didn’t want to hear it. So far, I’ve uncovered nearly 1,500 pages of records that show what happened as Penn State struggled to respond to the Sandusky scandal. I’ve done everything I can to get the news media to ask some of the obvious questions they raise. But I’ve been consistently disappointed at the complete lack of curiosity, even when a story is handed to them on a silver platter. The only possible explanation for the Patriot-News’s ignorance is that it can’t stomach the idea of poking holes in a story it worked so hard to write. Sarah Ganim was a good newshound, and she deserves a lot of credit, despite what her critics say. But while she never wrote anything inaccurate, it increasingly looks like she got played. For the Patriot-News to take a serious look at the relationship between Frank Fina, Louis Freeh and the trustees’ Special Investigations Task Force would require a complete re-examination of its own reporting. And I don’t think it has the cojones for that. This editorial truly angered me, not as a Penn Stater, but as someone who believes deeply in the importance of a strong Fourth Estate. American journalism is in decline, and this episode demonstrates the Patriot-News is leading the free fall. Mr. Bagwell tells an incomplete story. No one at PennLive is barred from talking to news staff. These exchanges happen regularly. But there is a separation between news and opinion, so that the editorial stances the newspaper takes are independent of its coverage. That is journalism 101. I regret coming across as “defensive and condescending.” But we firmly believe Penn State needs to move on from the Sandusky tragedy. That is not the same as whitewashing it or refusing to ask questions about it. For Mr Bagwell to suggest otherwise is intellectually dishonest. Mr Micek – Please explain how you can ask questions about the Sandusky tragedy while moving on? This seems to me to be contradictory. What I wrote is an accurate representation of the reason you provided for not knowing that two of your own newsroom employees sought the same information you said others should not. Refusing to admit your newspaper’s own hypocrisy is the only intellectually dishonest thing happening here. It is important for Penn State to put an end to the rampant alumni speculation that prevents the university community from finally moving forward. Releasing records of Freeh’s investigation would go a long way toward that goal. You can’t “move on” from anything until you learn all the facts about what happened and right the wrongs that can be righted. Many people did things that were wrong here, and I am not referring to the 3 that are charged. For the Patriot News not to care to learn more about the very questionable role of Pennsylvania’s sitting governor and the failures of law enforcement and child protective services is disturbing. For a newspaper to suggest that finding out the truth of what happened at Penn State (not found anywhere in the Freeh Report) and dealing with those responsible for the total mis-management of this whole crisis should not be a very important priority of new trustees is ridiculous. There will be NO moving on until this situation is resolved and the truth known. For a newspaper to basically suggest that sweeping this under the rug and moving on is the way to go is insane. As someone with a communications degree who worked in TV news for years, I am embarrassed that a journalist would not find the pursuit of the truth to be the highest priority. We all know that being a member of the Board of Trustees is more than a one issue job. The university faces many challenges that have nothing to do with this scandal. I am quite sure that our trustee candidates, like Ryan Bagwell, who are committed to getting the truth about the Sandusky Scandal are capable of multi-tasking. Responsibly guiding Penn State’s future and dealing with the mistakes of the past are not mutually exclusive. Again, having reviewed most everything your paper has written on the Sandusky scandal it is clear to me that the editorial board is slanted and continues to slant the coverage of the scandal. Why is it that Charlie Thompson continues to write that The Second Mile stopped Sandusky’s access to children in 2008, when the trial testimony of Victim 9 clearly reveals he was abused through July 2009? Please explain that to us John. BTW, that’s just one example of how the Patriot News/Penn Live has been covering up for Second Mile, Corbett, and the state agencies. You’ll eventually learn about the rest…. So you “firmly believe” that Penn State and Louis Freeh shouldn’t hold themselves to the actual contract that they signed? The one which stated that Freeh would be made available to discuss his report. You “firmly believe” that people should get paid for something they promised but did not deliver? Isn’t that defrauding the taxpayers of the State of Pennsylvania, one of which is you? Or do you “firmly believe” that we should create tidy cosmetic fixes which do nothing to stop the next Sandusky? Or do you “firmly believe” that the Board should be allowed to “accept responsibility” by not actually accepting any responsibility and continue to occupy the cushy spots in the ivory tower? Or is it that you “firmly believe” that Penn State should preach transparency while showing at every turn the wish to HIDE the truth? Whether it be the the cancelling of Joe’s presser, the Freeh Report, the Consent Decree, public records requests, lawsuit discovery rquests, it’s clear they don’t want the light of day on this case. So please tell us, exactly which of these things do you “firmly believe? Except at the PN, it’s all opinion and no news. So how can there be separation? But it IS preposterous. A tragedy must be faced, must be seen without blinders; the truth must be vigorously sought. of a Titanic-sinking iceberg hiding always very close by, in the fog and shadows. Pedophilia, pimping kids to donors, organized crime, sports betting (of course college too). It’s a bigger, uglier story fighting to transcend the very expensive cover-up, still well underway. SO many have so much to lose. No wonder “Move on. There’s nothing to see here” is so oft parroted. I too would agree that Ryan is telling an incomplete story. 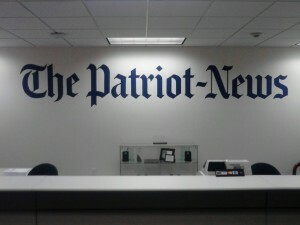 I have exhaustively catalogued and reviewed the Patriot News Pulitzer prize winning coverage as well as its non-Pulitzer winning articles about the Sandusky scandal and find them to be full of inaccuracies. Ms. Ganim was no worse or no better than any of the other reporters there. Her articles were reviewed by the paper’s lawyers and editors before they went to print. Of course, the editors didn’t catch everything, so some incriminating info got published — on the first run. The editors attempted to fix that information on the second run. You are on notice that your paper – along with the Governor, DPW, and the Second Mile — appears to have Endangered the Welfare of Pennsylvania’s children. Well, if the news media doesn’t want to know what really happened, it appears the Courts do and I can’t wait to hear Penn States response on why the accepted the sanctions. The Courts are asking why and who decided this. By the way, people will be under oath now. It should have been asked by rags like the Patriot News; but okay, it is what it is. Joe Paterno will go down in History; but not because of Sandusky. It will be because of the impact he had on the restructuring of the Board of Trustees, his impact on the restructuring of the NCAA and how journalists and the legal profession do their jobs. First, anyone reading the Patriot News is simply looking to be aggravated. They always take a negative slant in anything related to Penn State. Do what I did a few years ago, cancel your subscription and erase the Pennlive app. Life is better, trust me. Finally, who cares what they have to say on this topic? It does not change a thing. The various lawsuits are proceeding and Ryan’s great work on prying loose the data is helpful as well. In the end, the courts will be the deciding factor in this story line. That is why I am both confident and optimistic. The problem with “move on” is nobody has really defined it. When the PSU board of trustees says “move on” it seems to be saying: Stop bothering us with questions, don’t rock the boat, make your donations, buy your football tickets and otherwise just generally shut up and let us continue to be in charge here. I think I’d have a little different definition of “move on.” It would be — let’s move on from the Freeh Report to find out the truth about whether PSU administrators from Spanier to Paterno knew Sandusky was abusing boys and protected him. Doesn’t it make sense to answer that question if we can, rather than just accept Freeh’s speculation as the final word? Isn’t the Patriot News going to continue to report aggressively on the case as the trials go forward? Isn’t that an important thing? If it’s an important thing, isn’t it also important for people like Bagwell to keep digging and writing as well? To me “move on” might mean — let’s really change Penn State culture, let’s learn from what we DO know about the Sandusky case. Let’s move on from the leadership culture that had grown so complacent and ingrown and secretive. Let’s move on from a university led by PSU “lifers” who were so insular that at very least they didn’t ask the right questions about what to do about Sandusky. And they didn’t have anybody in the room who could help them ask the right questions because outsiders weren’t invited in. If we want to change the ingrown culture at Penn State, why not start by getting some outsiders on the PSU board instead of insiders and sycophants? I think everybody associated with PSU can be on board with “move on” — the trouble is, it means different things to different people. Interesting that Patriot News does not have the same tenacity to pursue Sandusky and The Second Mile as it did when it took Penn State to court to release Joe Paterno’s salary.